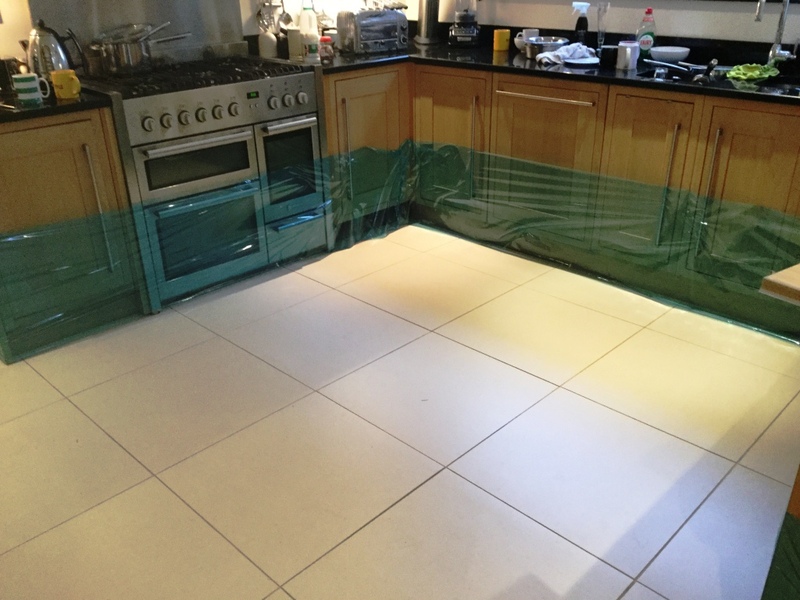 This customer called us as she was deeply concerned by several problems with the grout between her large format white Porcelain kitchen tiles. The grout was not only very soiled, but had also cracked and dislodged in places because of her underfloor heating. The constant heating and cooling of the floor had caused the grout to expand and contract – and because it was not the flexible variety, it had cracked quite easily. 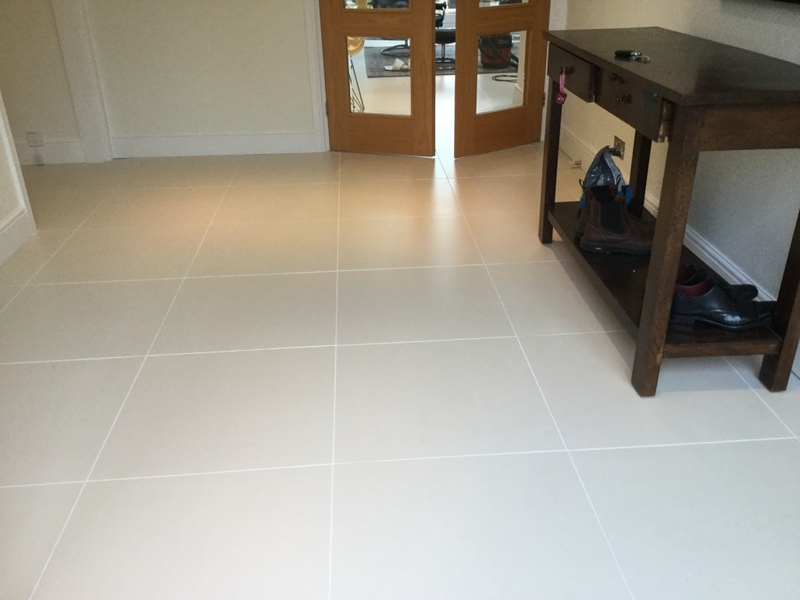 The tiles themselves were not proving too difficult to keep clean as Porcelain is naturally quite durable. However, every time the customer had cleaned the floor, the grout never really improved in condition. In fact, it was getting worse over time. 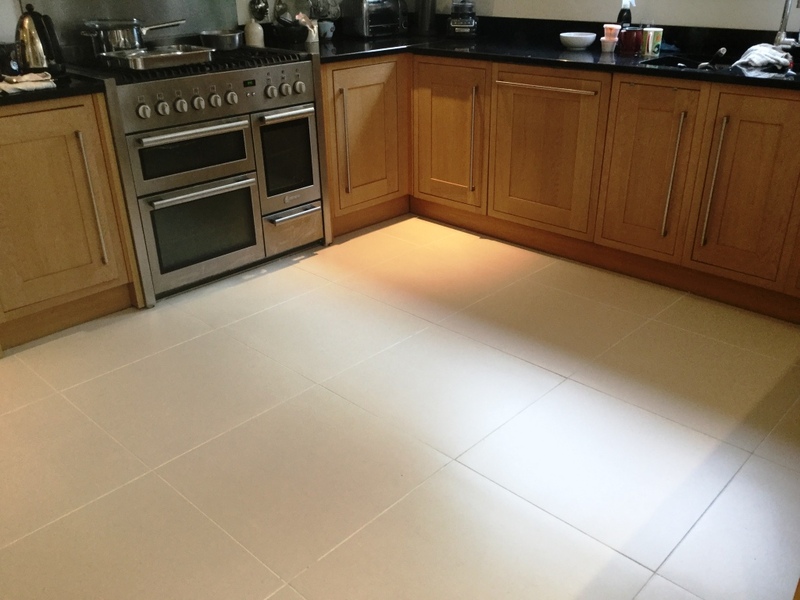 A quote was given to restore the grout and the work was booked in the following month. The property was in Studham on the edge of the Chiltern Hills in Bedfordshire. The first thing we did was to protect the kitchen units with a plastic wrap and remove the plinths under the kitchen units to prevent them from exposure to any cleaning products. The tiles were vacuumed to remove any loose debris and dirt, before being washed using a mild solution of Tile Doctor Pro-Clean, which is an alkaline-based cleaner that’s safe to use on tile and grout. As aforementioned, the Porcelain tiles were in good condition to begin with, so the cleaning process was not too intensive. We also scrubbed the Pro-Clean into all the grout lines to remove as much staining as possible, as well as to prepare them for recolouring. Next, the area was rinsed with water to remove any trace of cleaning product and the resulting slurry was extracted using a wet vacuum. The floor was then dried quickly using fans so that we could assess how well the grout had responded to cleaning. Following this, any loose grout was dug out and replaced with fresh grout. Once the grout was fully dry, we started the process of re-colouring it. 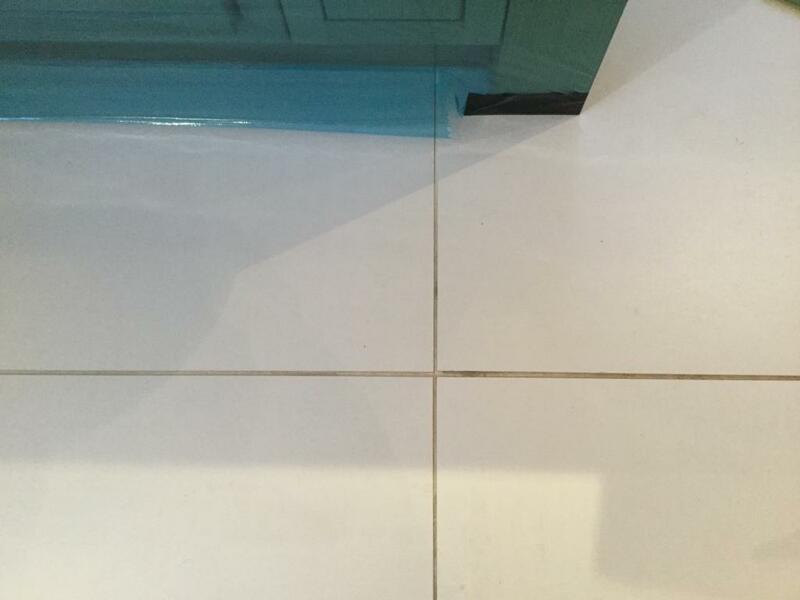 This was done using our own Tile Doctor Grout Colourant, which seals and rejuvenates grout joints, protecting them from everyday staining and ingrained dirt. There are 10 different colours of Grout Colourant available in our range, including Charcoal Grey, Black, Cappuccino, Limestone, and White – the latter being the colour the customer opted for this time. The product is applied by hand using a small brush. You allow it to dry partly and then any excess is wiped off the tiles, as once set it is extremely hard and durable. The pictures above show the difference our grout re-colouring service can make. 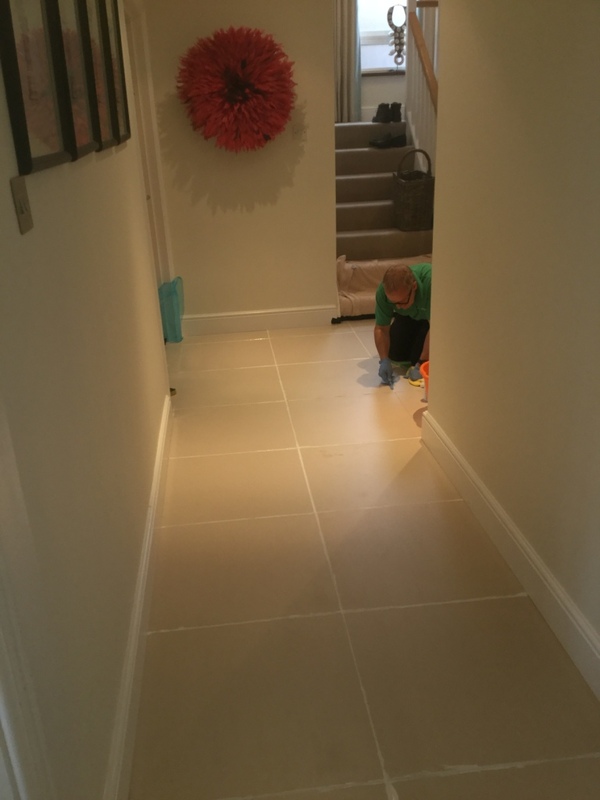 The customer commented that the work made the floor look newly installed, as she felt it had never looked truly clean before. Another satisfied customer and with the colourant protecting the grout it should stay that way for some time. 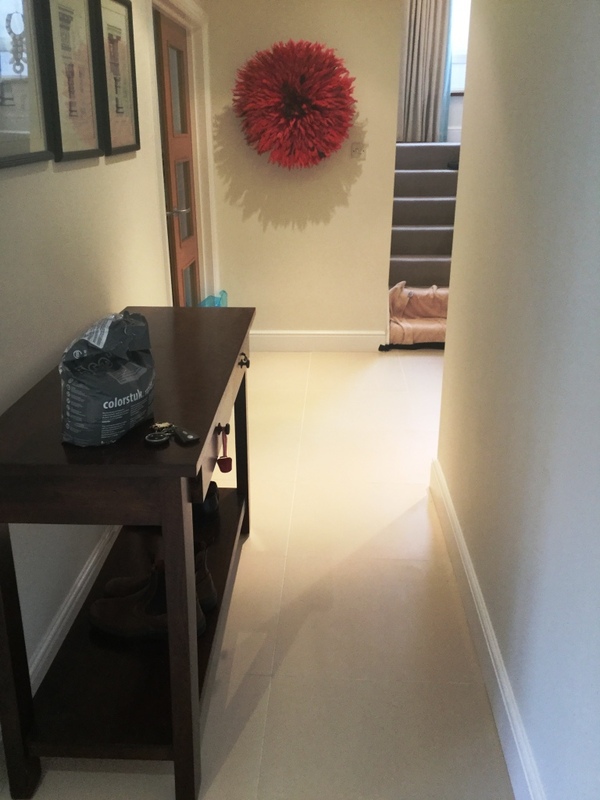 This entry was posted in Porcelain Posts and tagged bedfordshire, Chiltern Hills, Grout Recolouring, Porcelain Tile Cleaning, Studham Grout Recolouring, Studham Tile Cleaning by AbzDominise. Bookmark the permalink. Covering Bedfordshire and the surrounding area Mathew Harris is an agent of Tile Doctor, the largest Tile, Stone and Grout cleaning network in the UK who have developed the products and techniques to handle a multitude of issues surrounding tile restoration including grout, internal or external.